Two planets found around a distant star have been described as the most similar to Earth yet discovered. The planets in the newly found Kepler 62 system are made of rock and ice, and researchers believe they could contain water. 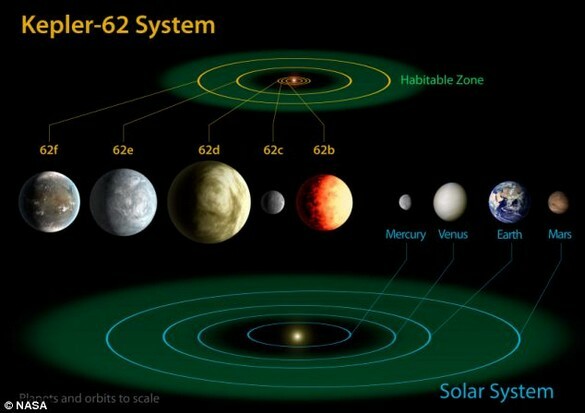 Kepler-62e and Kepler-62d are among five new planets found within the 'habitable' zone of a Sun-like star. They were identified by data from the Kepler mission launched in 2009 to identify extrasolar planets. It has so far resulted in several dozen of some 3,000 'Kepler Objects of Interest' having been studied in detail but of those the 'five-planet system' is the most important. Crepp noticed a faint dot near Kepler-62 a year ago, leading to months of detailed study to confirm the planet interpretation. The discovery was made by astrophysicists at the University of Notre Dame. The findings were published in Science magazine. Researchers use fluctuations in the brightness of a star to identify the presence of a potential planet whose transit periodically dims the light of the star. Crepp uses large ground-based telescopes to image the host star and analyzes the system to make sure other astronomical phenomena, such as nearby eclipsing binary stars, are not causing the fluctuation, a common 'false positive' encountered in the research. 'What really helped is that this star has five planets,' he said. 'You can mimic one planet with another event, but when you have five of them and they're all periodic, that helps to put the nail in the coffin. Kepler-69, the second new system revealed today, a two-planet system about 2,700 light-years from Earth in the constellation Cygnus. The two planets of Kepler-69 orbit a star that belongs to the same class as our sun, called G-type. Eric Agol, a Univeristy of Washington associate professor of astronomy, identified Kepler 62f, a small, probably rocky planet orbiting a sunlike star in the Lyra constellation. The planet is about 1.4 times the size of Earth, receives about half as much solar flux, or heat and radiation, as Earth and circles its star in 267.3 (Earth) days. It's one of two "super-Earth" planets discovered in the star Kepler 62's habitable zone, that swath of space the right distance from the star to potentially allow liquid water to exist on a planet's surface, thus giving life a chance. A super-Earth is a planet greater in mass than our own but still smaller than gas giants such as Neptune. Kepler 62's other super-Earth, nearby 62e, is 1.61 times Earth's size, circles the star in 122.4 days and gets about 20 percent more stellar flux than the Earth. The two are the smallest exoplanets — planets outside the solar system — yet found in a host star's habitable zone. 'The planets this small that we have found until now have been very close to their stars and much too hot to be possibly habitable. 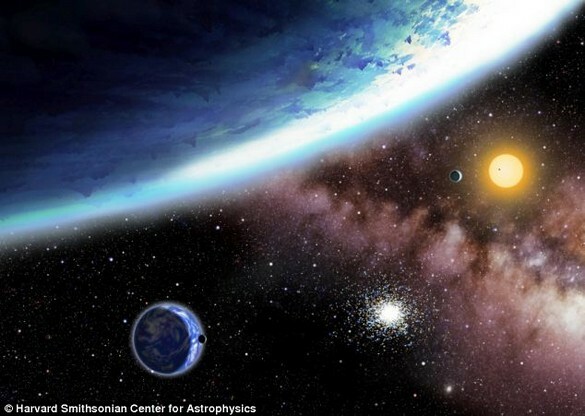 The artist's concept depicts Kepler-62e, a super-Earth-size planet in the habitable zone of a star smaller and cooler than the sun, located about 1,200 light-years from Earth in the constellation Lyra. Kepler-62e orbits it's host star every 122 days and is roughly 60 percent larger than Earth in size. 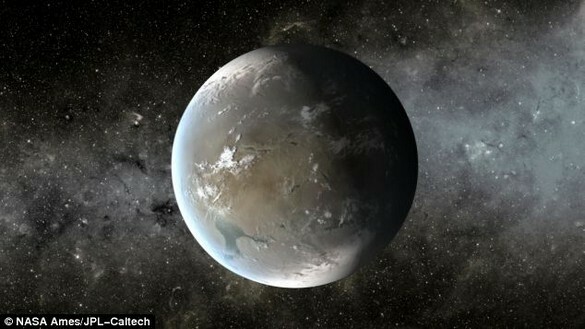 Scientists do not know if Kepler-62e is a waterworld or if it has a solid surface, but its discovery signals another step closer to finding a world similar to Earth. Kepler-62f, a super-Earth-size planet in the habitable zone of a star smaller and cooler than the sun, located about 1,200 light-years from Earth in the constellation Lyra. Kepler-62f orbits it's host star every 267 days and is roughly 40 percent larger than Earth in size. The size of Kepler-62f is known, but its mass and composition are not. However, based on previous exoplanet discoveries of similar size that are rocky, scientists are able to determine its mass by association. The artist's concept depicts Kepler-69c, a super-Earth-size planet in the habitable zone of a star like our sun, located about 2,700 light-years from Earth in the constellation Cygnus. 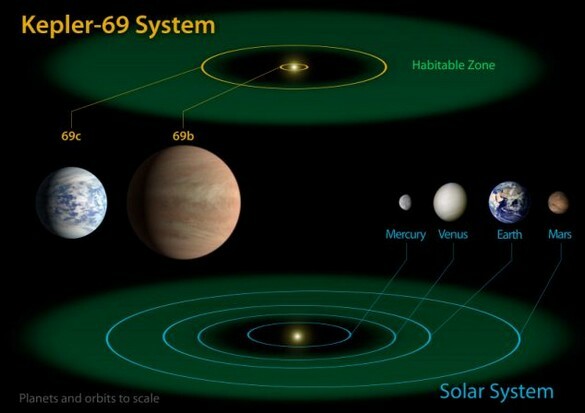 Kepler-69c, is 70 percent larger than the size of Earth, and is the smallest yet found to orbit in the habitable zone of a sun-like star. Astronomers are uncertain about the composition of Kepler-69c, but its orbit of 242 days around a sun-like star resembles that of our neighboring planet Venus. 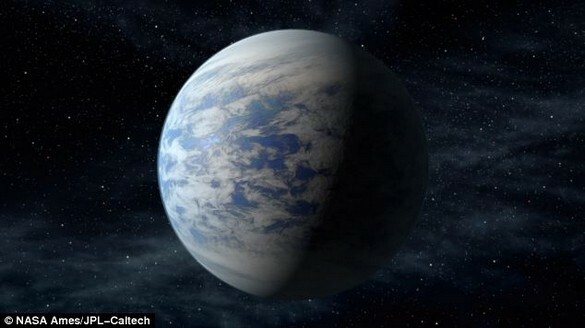 'This is the first one Kepler has found in the habitable zone that satisfies this small size," Agol said. Agol is the second author of a paper documenting the discovery published April 18 by Science Express, the online edition of the journal Science. While the sizes of Kepler 62e and 62f are known, Agol said, their mass and densities are not — but every planet found in their size range so far has been rocky, like Earth. 'Based on its size, our best guess is that it's rocky and has some atmosphere, but not a thick gaseous envelope, like Neptune,' Agol said. The Kepler telescope was launched in 2009 with the aim of finding Earthlike planets beyond the solar system. It detects planets by 'transits' that cause their host stars to appear fainter when the planets pass in front as they orbit. 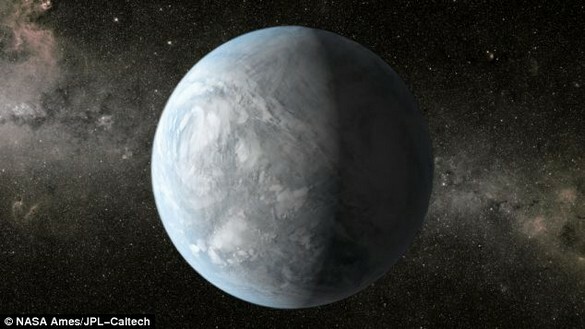 Kepler 62f was a late-arrival in terms of its discovery. Its planetary siblings were found by a team of researchers led by William Borucki of the NASA Ames Research Center, principal investigator for the Kepler Space Telescope. Kepler 62 b, c and d are 1.31, 0.54 and 1.95 times the size of the Earth, respectively, but orbit the star too close to be in the habitable zone. 'This type of discovery is the reason we launched the Kepler spacecraft — to find small, Earth-sized, potentially Earth-temperature planets," Agol said. 'At the same time, though, it isn't exactly the same as Earth. 'It is slightly larger and cooler than Earth.